Calling all AVOIDERS! Be sure to read this blog all the way until the end! We’ve been there a thousand times. It was time for a tough conversation and I (Casey) would be running for the hills trying to avoid talking about issues in our marriage. Early on, that was one of the major reasons why we were headed straight for a divorce. I pretended, ignored and avoided any issue that might come close to exposing my weaknesses, fearing that I would be in trouble, afraid of being abandoned... the list goes on. For years, I left Meygan all alone in fighting for our marriage. With tears in her eyes she begged that I engage with her, only then I began to see the magnitude of how my avoiding caused so much hurt and pain. I wrote the book on avoiding and it nearly killed my marriage. Which is why I’m so passionate about helping others ‘avoid’ the pain and disconnection. The problem was that I didn’t have any resource to turn to that gave me insight why I avoided and what I need to do next to show Meygan that I am showing up. Here are some Connecting Questions to get you and your spouse talking about your issues. When you were growing up, did your parents avoid their marriage issues? Why do you think that was? Who in your life is a major avoider of dealing with things? What are some habits they have? Have you ever felt alone in our marriage? If so, when? How does it make you feel when I bring up certain issues in our relationship? When conflict arises, do you tend to want to fight or avoid it? And why? Have I done anything that has made you feel like I don't care about our marriage? 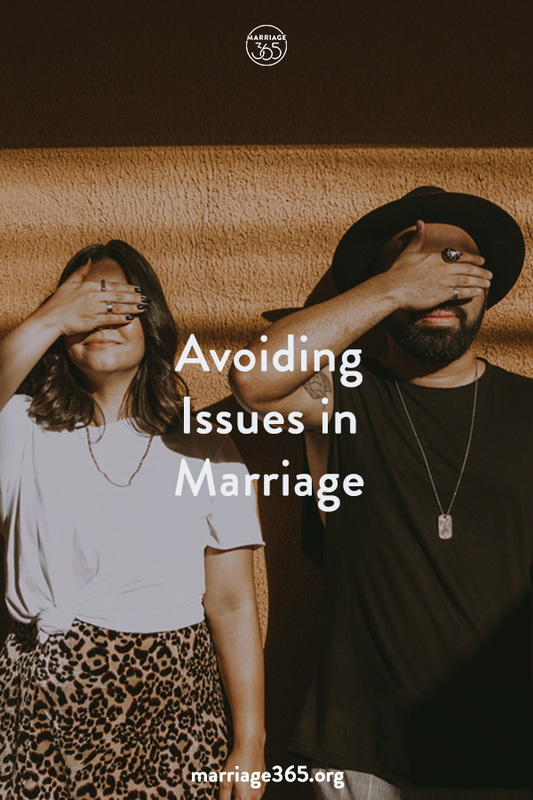 To get more Connecting Questions and to watch our entire video on why spouses avoid and how to engage in the issues that your marriage is currently dealing with, head to mymarriage365. Casey Caston is the co-founder of Marriage365 and loves his wife, kids, and surfing - in that order. He's passionate about teaching couples how to connect on a deeper level and works often with couples in crisis. He's also officiated more than 600 weddings. His life long dream is to walk the Camino, surf in Indonesia, and publish a New York Times best seller.